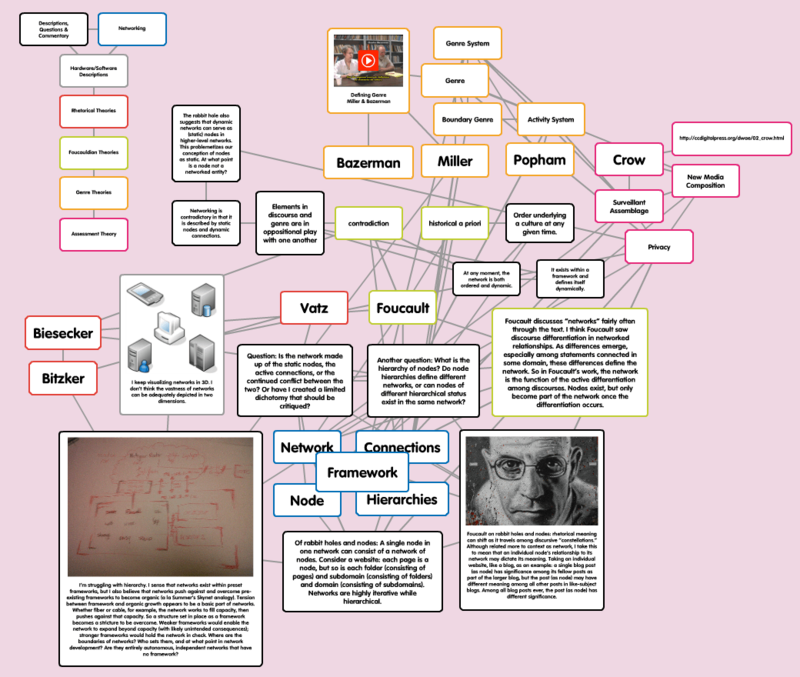 This week, like others in the class, I felt a need to add a little more structure to my mindmap. In response, I added a color key in the top left that codes each popple according its function in the map or relation to theorists. I identified two functions, marked in black and blue (without intentional reference to the intellectual bruising these theories are giving me…), to indicate “Networking” and “Descriptions, Questions & Commentary.” Networking references the parts of a generalized network as I’ve encountered them: nodes, connections, hierarchies, and frameworks. Descriptions, Questions & Commentary refer to questions and comments I made as I struggled with particularly puzzling aspects of theorists’ ideas or network functions. I’ve found less need to interrogate theorists as I’ve moved ahead in the class, at least in part because our latest theorists write more clearly about their own objects of study than our earlier readings. I continue to connect these questions and comments to other parts of the map as I find additional or more nuanced ways to answer or address them. Adding the color coding also encouraged me to more clearly articulate the relationship of ideas to theorists, so I ended up more closely aligning Foucault to “contradiction” and “historical a priori” and Bazerman, Miller, and Popham to “genre,” “genre system,” “boundary genre” and “activity system.” Interestingly, I discovered Miller discussed hierarchy in more detail that I had remembered, so I drew that connection. Miller (1984) identifies form as “metadata” for substance that offers instruction on how the symbolic representation is to be perceived; as a result, “form and substance thus bear a hierarchical relationship to one another” (p. 159). I connected Bazerman’s (2004) “activity system” to a network framework, as I understood the way Bazerman constructed the hierarchical relationship of genre set as part of a genre system, and a genre system as a part of an activity system; Bazerman claims analyses of the relationships among and between these systems provides “a focus on what people are doing and how texts help people do it, rather than on texts as ends themselves” (p. 319). Focusing on how texts help people do things is both active and framing, in that such focus offers a clearer understanding of text (and relations to people) within a framework of text (and related people) functions. These unconscious rubrics are likely themselves hierarchically networked, with diminishing levels of privacy concern along a continuum of the perceived importance of the data held in a network. As a result, I added privacy as a node in my network and started connected it to other nodes. Given the many-dimensional character of data (a lá rabbit holes) in which one network serves as node in larger networks, lower privacy concerns at lower levels of the network might become greater concerns at higher levels of the network. For example, while a collection of course assignments in Google Drive are themselves of little privacy concern, information found in those documents, like student ID, name, school, email address, and more might find their way as members of a school’s Google Drive network into larger surveillant assemblage maintained by Google. Corporate “Google” might be able to connect those Google Drive documents with emails sent via Gmail, websites visited following Google search results, and ads clicked from Google-affiliated display advertising networks to generate a remarkably accurate, if aggregated, profile of the user. Trust becomes a real operative word in the relationship between the user and Google. As a result, I predict adding “trust” as a node in the next update of my mindmap. In Google We Trust – Trailer from Journeyman Pictures on Vimeo. Crow, A. (2013). Managing datacloud decisions and “big data”: Understanding privacy choices in terms of surveillant assemblages. In McKee, H. A., & DeVoss, D. N. (Eds.). Digital writing assessment & evaluation. Logan, UT: Computers and Composition Digital Press/Utah State University Press. Retrieved from http://ccdigitalpress.org/dwae. Miller, C. R. (1984). Genre as social action. Quarterly Journal of Speech, 70(2), 151-67.